Tomás de la Fuente served as a missionary in Mexico and Honduras with an emphasis on expanding spiritual growth through the printed word. He established a publishing company in Mexico with offices in Costa Rica and published writings of many Christian authors, as well as some of his own work. Some of his better known writings in Spanish include Claves de Interpretación Bíblica and Diccionario Bíblico Elemental. In English, he wrote as Thomas E. Fountain: In His Shadow-the story of James the Just, and The Way it Was, from 5B.C. to 29A.D. : an interpretation of the life and ministry of Jesus Christ, in its historical context, among other titles. 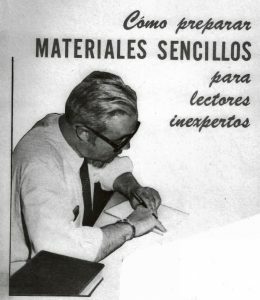 After obtaining an advanced degree in Literacy Journalism from Syracuse University, de la Fuente developed reading material designed to address the reading needs of newly literate Spanish speaking adults and for those desiring to develop their basic reading and learning skills. His application of scholarship in the development of appropriate Biblical study materials is carried forward in the current series of expanded versions of his work by his daughter, Sarita de la Fuente. In vocabulary common to the various Spanish-speaking countries, the little books in this series retell some of the great stories of Biblical characters whose actions model lives of faith for today’s readers and students.